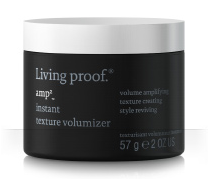 I have yet to try the Living Proof shampoo and conditioner, but they’ve now been added to my list. 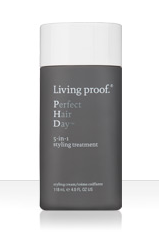 I continue to shower with my normal shampoo and conditioner and once my hair has been towel dried but still damp, I’ve been applying a quarter sized amount (they recommend less for fine or short hair, but since my hair is so thick I use a bit more) of the PHD Styling treatment all over my hair. I then blow dry using my fingers and a round brush and find my hair styles much more easily, it has great volume (does not weigh your hair down), and no fly aways. It also has UV and heat protection which is great since I’m back to washing my hair on a daily basis. Since I cut my hair short, I’ve been sorting through all of my products trying to find ‘the one’ that will magically put the finishing touches on my styled hair. Well, I’ve found it. Once my hair is styled, I rub a small amount (which goes a long way) of amp2 instant texture volumizer between my fingers until it becomes transparent. I then work it into my hair from the back to the front, lifting and messing my hair as I go until I ultimately shape it into my desired style. My hair ends up feeling texturized yet moveable which is perfect because I can’t stand stiff hair. I also can’t stand sticky hair and this product takes care of that too. I can easily run my fingers or a comb through my hair which I do randomly throughout the day to re-shape, and it stays just as I put it. Having a good hair day can start you off on the right foot and it’s likely that these products could make you feel the same as I did! I hope so at least! If you try them, make sure you let me know what you thought, I’d love to know! * This was not a sponsored post, just me sharing my thoughts on a product(s) I love! Oh, I love this! I have been intrigued by the first product and love hearing REAL folks’ opinion on this stuff. I’ll have to try it! Hi Marisa, I just ordered both and I can’t wait. Knowing you tried it and love it really helped me realize I need to pitch the hairspray!! I will let you know how I like them!